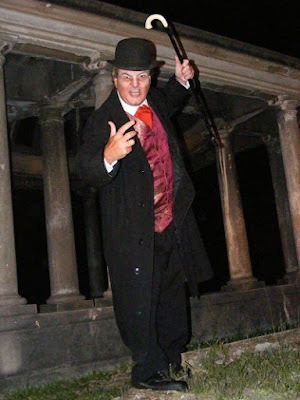 The ever-popular Mystery Ghost Bus returns to Durban for one night only this year, on August 4, 2018, and this time it promises an ending in an eerie historical cemetery. Now in its 18th year of running countrywide, this spook-tacular seldom makes it to the coastal cities, but when it does, it is always well-attended by ghost hunters, those who enjoy history, or simply those who want to be entertained – it caters for all tastes, as well as old and young. This ‘production-on-wheels’ is unlike the typical ghost tour, in that its owner and ghostly host, illusionist Mark Rose-Christie, brings far more to the evening, by adding special effects, a clever scare or two, and an explanation of the science of the paranormal, where the audience are able to experience force fields for themselves during the dowsing rods audience participation segment of the tour. There are also some pub stops to calm one’s n-e-r-ves and indulge in ‘spirits’ of another sort, with the other off-the-bus stops including the famous poltergeist house of Campbell Road, and of course at the very end of the tour, the cemetery – where Rose-Christie presents a chilling climax with a suitably thrilling visual effect. Known to have turned skeptics into believers with his explanation of the different types of ghosts, whilst giving credible scientific reasons as to why they appear, one of the highlights of the tour is no doubt the famous ‘Spookhouse’ (as it is known to locals) of Musgrave Road. Other haunted buildings include The Playhouse, which has a phantom lurking under the stage, as witnessed by none other than well-known actor Joseph Clark; Durban Boys High with its tragic tale of the science master who died after an explosion; the sad tale of the little boy who committed suicide at Victoria Mansions; the diabolical tale of South Africa’s most famous poison murderess, Daisy de Melker, at the old Berea Nursing Home; the well-known phantom hitchhiker who is the young Indian girl known as ‘Highway Sheila’; and many more spooky tales and venues along the dark streets which the coach glides and winds through during the entire evening. One of the highlights of this year’s tour is the nuance of ghost-hunting apps, where Rose-Christie shows everyone how to download them onto their cellphones, such as EVP recorders, EMF meters and the Spirit Box - the latter which scans frequencies and prints entities’ words directly on one’s cellphone screen. Mystery Ghost Bus will run in Durban on August 4, 2018. R369 pp booked at www.MysteryGhostBus.co.za The tour runs from 19h00 to just after midnight (of course), and guests are asked to bring torches, cameras, flat walking shoes and ‘pub & grub’ money, on this chilling, thrilling, journey that you’ll never forget! !